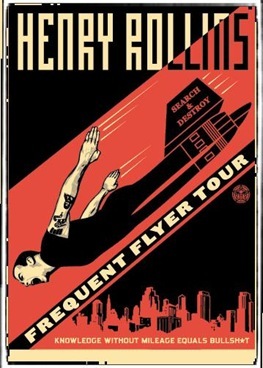 Last night we checked out Henry Rollins at his spoken word performance in Halifax. I must admit to being more familiar with his work in Black Flag than anything else, so, I was looking forward to experiencing him in a different ‘format’. I was not disappointed, although I would have liked a bit more anecdotes from his visits to various countries. He spoke, without a break, for three hours. Weaving seamlessly between topics such as, homophobia, war, elections, travel, music, adolescence and acting. Here’s a favourite of mine, from an earlier tour, about a friendly rivalry between him and Iggy Pop.